This article is relevant to Arculator and RPCEmu, running RISC OS versions 3.00 to 3.71. Almost all RISC OS software is distributed in ZIP or ArcFS 'archives', yet RISC OS itself has no ability to unpack these files built-in. 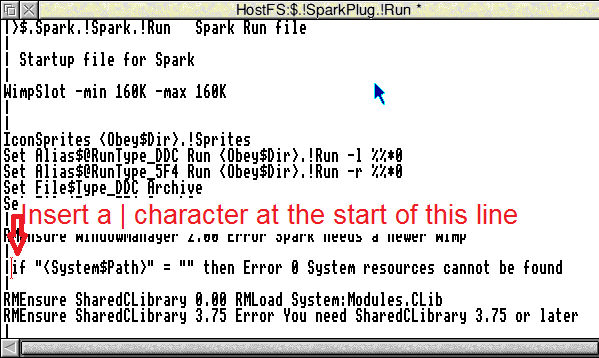 So one of the first things you will need to do on any RISC OS installation is to install an un-packer, and the easiest one to install is !Sparkplug. And place the splug226.bas file into the emulators arculfs (Arculator) or hostfs (RPCEmu) directory. Run the emulator. Open the the arculfs/hostfs filer and find the splug226/bas file. We need to set the filetype to basic, to do this middle mouse-button over the file and select "File 'splug226/bas'"->"Set type" from the menu and type 'basic' followed by enter, in the popup box there. This should change the filetype, which changes to a blue icon with white text in. Run this program by double clicking it. This outputs some progress until it is finished. Press SPACE or click mouse to continue. 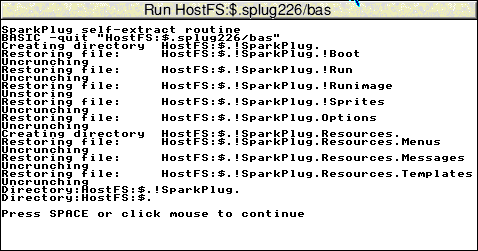 This will have created a !Sparkplug application in the same directory as the splug226/bas file. 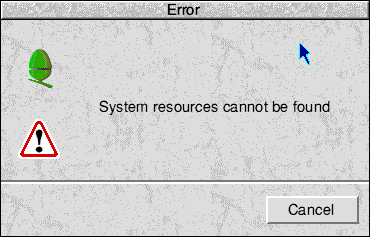 Double-click it to run it and it will print up this error message. Let us resolve this now. Note this fix only works if you are running RISC OS 3.00 or later, for RISC OS 2 you will need to install !System which is more complex. Shift-double-click (double click whilst holding the shift key) the !Sparkplug icon. Shift-double-click the !Run icon. This should load the contents of the !Run file into the text editor !Edit. We need to find the line "if "" = "" then Error 0 System resources cannot be found", and modify if so the comment character | is on the start of that line. Save the file by pressing 'F3', and clicking 'ok' or pressing enter (or dragging the file icon back to the directory with !Run in). Re-run !Sparkplug and this time it should load and its icon appear on the iconbar. It is now ready to use.